Our Process Model or Process Value Chain is the strategic grouping of our key process groups or families in a manner that defines optimum integration and benefit to enable a seamless process delivery from Customer Request (inception) through to Customer Delivery. At the core of our model is the Project Management Office (PMO) with its process sets as the key operative business model within Kwezi Software Solutions for channelling every opportunity, engagement or business change requirement, be it internal or external in nature. This PMO core is then surrounded by the other process family sets above by Pre Sales, Sales, Bid and Contract Management, below and underpinned by HR, Finance, Legal and Risk. At the very top it is over arched by Strategy and the Key Business Management Group sets Marketing with Sales, Technology and Operations. Core to this group is the centralized Process Set of Portfolio which is the heartbeat of the organisation in terms of its range of specialised product and service offerings which can be cherry picked per each unique Customer engagement and requirement. All is sandwiched and contained on the left and right sides by Governance and Control respectively. 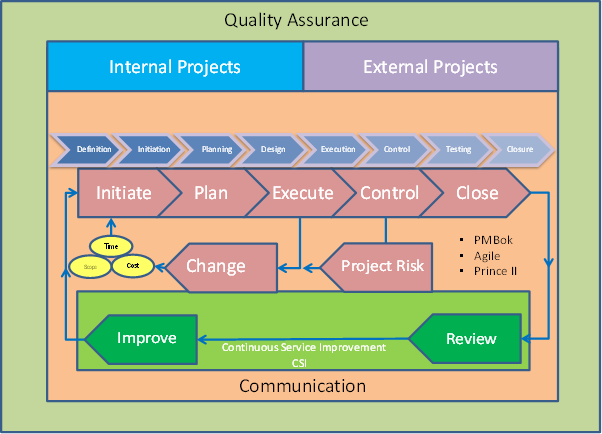 The PMO Core is modelled on PMBok Process Methodology with the 5 key project lifecycle Steps of Initiate, Plan, Execute, Control and Close, these are in turn underpinned by Project Risk and Project Change Control. Loop closure of the lifecycle is maintained via the 2 key steps of Continuous Service Improvement (CSI) namely Review and Improve. The PMO delivery process sets are then flanked respectively by Communication. The entire PMO set is encapsulated by Quality Assurance signifying the key defining element that Quality is a primary consideration for each and every Step and Activity within the lifecycle. Kwezi Software Solutions is a Process Centric company and we are at the leading edge of Process development and implementation. We strive to deliver our suite of professional client product service sets via expert process driven teams that integrate seamlessly across the implementation Lifecycle for products and services from tender and bid through to decommissioning and rundown. We are so confident within our leading edge process development via systematic rollouts, and constant review for effectiveness and efficiency that we offer a unique set of consultancy skill sets delivering an added benefit for our clients in the realm of world class Process Consulting skills. We can perform as-is evaluations of your current process approach status and related maturity levels, from there then perform the desired to-be states and provide a detailed rollout / improvement roadmap with associated business impact assessments, and the necessary process re-engineering requirements for optimised efficiency and integration via the introduction of suggested changes and improvements. At Kwezi Software Solutions we pride ourselves in being a step ahead when it comes to our Governance and Compliance We seek to align our business practices and processes ensuring seamless and congruent alignments for compliance wherever called upon to do so in terms of governing legislature and compliance. We have adopted a two pronged approach to our Governance Framework which consists of both Corporate Governance and IT Governance dictating our business models and terms of reference with regard to management and control. Direction and leadership - refers to the quality of Kwezi Software Solutions's strategy, the calibre of the executive and senior management charged with developing and implementing the strategy, and the calibre of the board charged with supervision and oversight. Risk Management and Control - refers to the processes in place to identify, evaluate, monitor and control risks associated with the successful delivery of strategic and operational objectives which ensure sustainability. Accountability and Reporting - refers to the provision of a true, fair and accurate account of the stewardship of Kwezi Software Solutions, in a transparent manner providing optimum relevance for stakeholders. Kwezi Software Solutions has adopted and promotes King III as its key guideline in ring fencing and managing Corporate Governance requirements with associated outputs. 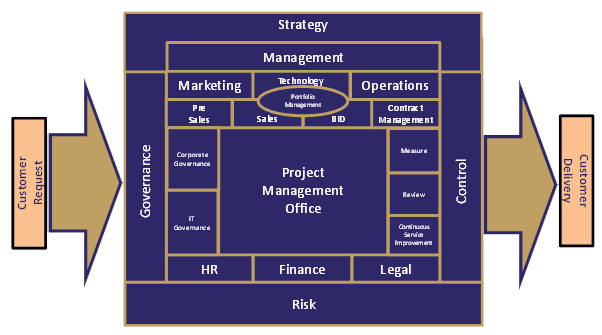 This dictates the way in which we demonstrate the management and control of all our IT related management disciplines. Here we adopt traditional tried and tested techniques for ensuring compliance to the most optimised best practice methods and frameworks of IT Governance. We principally use the CobIT framework under ISACA (International System Audit Control Association) for benchmarking of compliance and maturity levels. We promote strong compliance and monitoring via a comprehensive subset of process enhanced Quality Management Systems defined in accordance with the ISO 9000 family set of standards, always striving for new and improved levels for and toward maintaining our ISO 9001 compliance and certification. In the interests of corporate and staff safety we comply stringently with the broadly accepted requirement for conformance with Occupational Health & Safety (OHS) Act and the ISO 18001 standard. We are also a company that supports and believes in green initiatives and looking toward constant improvement of our entire work environment and earth footprint. To this end we comply with the environmental requirements of the ISO 140001 standard. As with our Process domain, we offer specifically tailored specialist governance consultation skills within the realms of both Corporate as well as IT Governance, together with key consulting skill strengths in ISO 9001, ISO20000 with the Health and Safety and Environmental certification standards of ISO 18001 and ISO 14001 respectively.